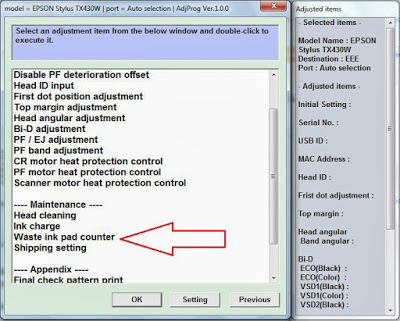 Learn here how to reset the pads of the Epson Stylus TX430W printer, get the software and if you have any questions, just write a comment. 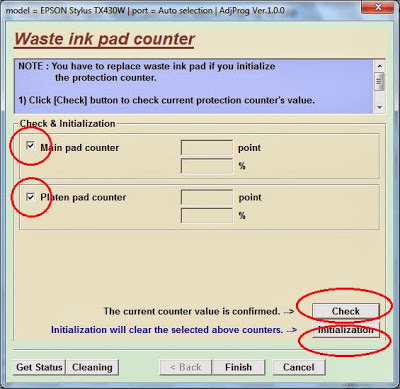 Reset an Epson printer is a simple matter if the file has to help us restore the pads. With the passage of time when these printers reach their maximum print, you need to reset the page counters. These pads are physically, but in the memory of the printed page is a lot when the manufacturer comes to the conclusion that the printer is not in its best to continue printing without leading technical support. Below we present a download link for a file that will help us solve the problem and the procedure used to restore the print pads. When we download the file unzip it, so we recommend using Winrrar, a document called RESET_EPSON_TX430W appears, we must double-click to run left or right click and then open. Then we will display the same window but with the printer information will be in the top left information modeling, language and port where the printer is connected. Importantly, verify that you have the printer that appears in the message, leave default in Port Auto selection for the port. As you can see in the picture above, down a bit to get where said wasted ink pad counter, select this option and then click on OK.
We will see options for pillows, select the two boxes on the left side pad main counter and counter platen pad, followed by check and initialization. Finally click on finish, turn off and turn on the printer, everything should be working properly. Gone are the flashes and the printer can print correctly and if the problem has not been resolved, type a comment in this publication.